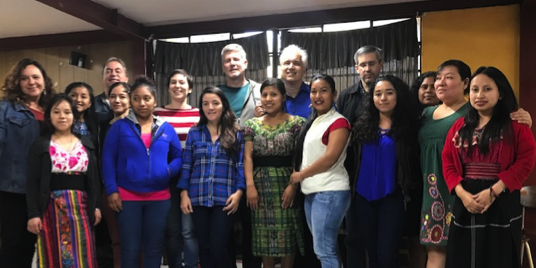 LPP student Maria Gabriela Martinez reflects on the security workshops for Indigenous female journalists held by PEN and the University of Toronto’s International Human Rights Program in Guatemala City, December 7-9. Susana (not her real name) was cheerful. On December 6, 2017 she was heading to Guatemala City for a training event when she got the call. A colleague from a national radio station was phoning for details on a piece of breaking news: the shooting of a community leader in Jutiapa, Susana’s hometown, a south-eastern city, close to El Salvador. Susana started to process the information, she realised that the victim was her uncle, a candidate for local elections and principal of one of the community schools. He had been killed in front of his home by unknown assailants – the second Jutiapa politician to be murdered in 2017. Soon afterward, despite her shock, she was reporting the news with remarkable composure. At the age of 21, Susana was facing one of a journalist’s most challenging tasks: reporting on a family tragedy that is also the tragedy of entire communities in her native Guatemala, a country with countless stories of intimidation, crime, violence, and impunity. As a community-based female journalist, Susana knew too well that this is the daily reality of hundreds of Guatemalan community journalists who work in a climate of fear and state-sponsored censorship. Even though the current legal framework excludes grassroots media from access to radio frequencies these journalists operate at the bleeding edge of public interest journalism, covering land disputes between communities and development projects, crime, corruption, and drug trafficking. Susana wanted to return home and mourn her uncle, but the training was also important. She was about to learn how journalists could reduce their risks while working in dangerous environments, and she would receive basic training in digital security, and emotional self-care. Once in the classroom, she immediately connected with the rest of the group and shared her story with 15 women journalists, from rural communities just like hers, who understood her trauma completely. From December 7–9, 2017, the journalists received hands-on training from Frank Smyth and Javier Garza of Global Journalist Security, and Marcela Turati, a well-known Mexican journalist and trainer. The workshop was organized by PEN International and PEN Canada with The Human Rights Defenders Project and Unidad de Proteccion a Defensoras y Defensores de Derechos Humanos Guatemala (UDEFEGUA) as local partners. The work was funded by PEN International. The initiative was the result of a November 2016 research trip in which PEN and the International Human Rights Program at the University of Toronto’s Faculty of Law prepared a submission on freedom of expression in Guatemala for UN’s Universal Periodic Review in March 2017. The report found that female journalists were particularly vulnerable to violence and intimidation, including sexual violence, and that indigenous journalists lacked adequate and meaningful access to media not only because of a restrictive and discriminatory legal framework but because few, if any, basic security measures were available to them. The training sought to empower the community journalists by teaching them how to manage risk on a daily basis. Once they had grasped the basic principles, they practised contingency planning so that they could adapt to specific threats. By the end of the workshop each participant knew how to identify key threats and devise appropriate countermeasures. They had also learned the importance of self-care, and had shared with each other the traditional practices that kept them grounded and motivated to continue reporting on their communities. I returned to Toronto inspired and optimistic. For three days, I had collated their feedback on the training in preparation for a months-long follow up that would track the implementation of their safety plans. It was motivating to see how these women go out every day to do their jobs, to observe their passion and dedication and to hear the stories that they cover, from the defence of the land and communities to the preservation of local traditions and languages. I noticed the link between freedom of expression and the cultural rights of an entire nation. Community journalists play a significant role in the preservation of the collective memory of Guatemala, a society still recovering from years of civil war and an entrenched culture of impunity. In a country where media ownership is heavily concentrated in the hands of a few powerful people, their voices fill a void, shedding light on what happens in rural communities, preserving their ancestral culture and bringing a different perspective to the public debate. During the workshop, the journalists not only shared and learned new skills; they also participated in roundtables with other journalists from mainstream media and human rights activists across Guatemala. Their voices are now amplified and strengthened with the connections that they made. Maria Gabriela Martinez is an LPP student at the International Human Rights Program and is a Venezuelan human rights lawyer.